Production is now underway on the new film from Chilean filmmaker Pablo Larraín. We just featured a trailer for his latest film The Club (highly recommended), now we have a first look photo for his next one. 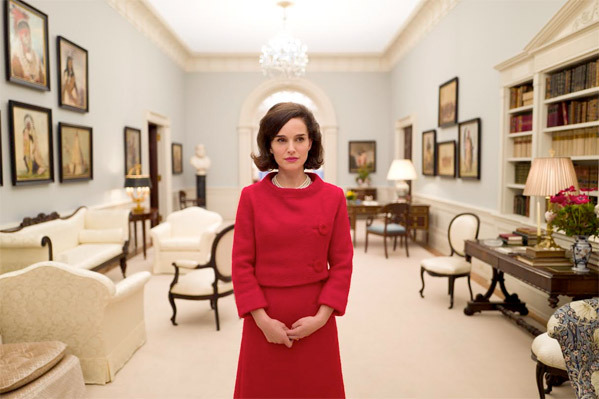 Jackie stars the immensely talented Natalie Portman as Jacqueline Kennedy, following her in the days after President John F. Kennedy's assassination in 1963. The film is in production in Paris right now, and this photo via Deadline shows Portman in wardrobe as Jackie in a nice living room. "Pablo is a masterful filmmaker, the cast is top notch, and we are thrilled to be working with him." I agree, he is a masterful filmmaker and I'm looking forward to seeing what he's whipping up with Portman in this film. In full below. Synopsis: An account of the days of First Lady, Jacqueline Kennedy, in the immediate aftermath of John F. Kennedy's assassination in 1963. Jackie is directed by Chilean filmmaker Pablo Larraín (of Fuga, Tony Manero, Post Mortem, No, The Club previously), from a screenplay by Noah Oppenheim. Darren Aronofsky is producing with his Protozoa partners Scott Franklin and Ari Handel, along with Fabula Films' Juan de Dios Larraín and LD Entertainment CEO Mickey Liddell. The cast includes Peter Sarsgaard, Greta Gerwig, and John Hurt. This sounds like it's going to be something to keep an eye on once it's finished. I'm so glad to see Pablo Larraín making more films non-stop. This film will likely be released sometime in 2016 (or 2017). Cool. Very subtle jawline makeup or prosthetic. Stunning promotional shot. This could end up being really fantastic.